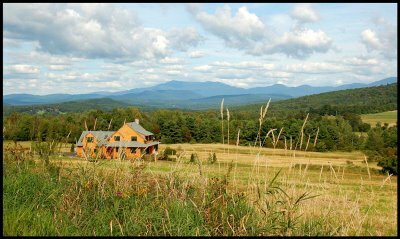 The mountain seen in the background is Mount Mansfield, which is the highest mountain in Vermont at 4,393 feet. This point of view is from the outskirts of the town of Williston. Apparently, the house you see in this picture is priced at $1,000,000.00 US Dollars. Houses in Vermont are quite expensive, and with some land, it does go up significantly. An average house in Vermont costs $250,000. I copied the following information about Mounts Mansfield from Wikipedia. You can read more about it there. "Mount Mansfield is the highest mountain in the U.S. State of Vermont. The peak elevation, in the town of Underhill, is 4,393 ft. (1339 m) above mean sea level. The mountain has the appearance of a human face when viewed from the east with distinct forehead, nose, lips, chin (the highest point) and an Adam's apple.Mount Mansfield is one of the two spots in Vermont where true Arctic tundra survives from the ice ages. A few acres exist on Camel's Hump immediately to the south, but Mount Mansfield's summit still holds about 200 acres."